Lloyd Garmadon will stop at nothing to retrieve the golden Fangpyre staff from its slithery servants. Unfortunately for him, Fangdam activated the snakes Wrecking Ball crane to teach him a lesson. Can Lloyd still swipe the staff with Coles help? You decide! Watch out for the swinging ball, biting snake head and venomous tail! This toy costs approximately £29.99 (for the latest and best prices make sure you check our retailer list for the LEGO Ninjago Fangpyre Wrecking Ball 9457 above). 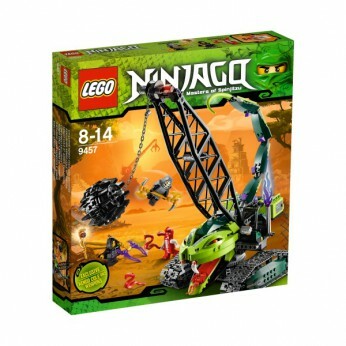 In our review of LEGO Ninjago Fangpyre Wrecking Ball 9457 we classed it as being suitable for ages 6 years, 7 years, 8 years, 9 years, over 10 years but recommend you check the manufacturer specific advice before purchasing.